Instead of maintaining a dangerous status-quo, Washington should attempt a new approach to avoid a possible deadly strategic rivalry. My new book, The China Choice, explores the decision America faces about its relations with China and its role in Asia as China’s power grows. But the title may be a little misleading, because of course there is more than one choice to be made. America faces at least two decisions, and one of the keys to making them well and getting them right is to consider them in the right order. The first is on the question of principle: should America even contemplate changing the role it plays in Asia, in order to accommodate China’s rising power, or should it insist on preserving the status quo? The second is on the question of degree: how far should America be willing to go to accommodate China, and where should it draw the line beyond which it is not willing to make further concessions? Rory Medcalf’s valuable critique of the book here on The Diplomat last week focuses primarily on the second question, and makes some important points about it which I will explore a little later. But I’ll start by saying something about the first question, because we cannot decide how far Washington should go to accommodate Beijing before we are quite clear that it should even try to do so, and why. In The China Choice I argue that America should try to accommodate China’s growing power. I propose that it should be willing negotiate a new regional order in which it continues to play a major strategic role, but not the kind of primacy that it has exercised until now. The main reason is simply that China no longer accepts U.S. primacy as the basis for the Asian order, and that as its power grows to equal and overtake America’s, the chances of successfully imposing primacy on China are too low, and the risks and costs of trying are too high, to be justified. Even if China may not become strong enough to dominate Asia itself, it is already strong enough to prevent the U.S. maintaining primacy. If America tries to perpetuate the status quo, there is a very real risk of an escalating contest which neither side could win, and which could very easily flare into a major, and perhaps catastrophic, war. The main reason for America to seek an accommodation with China is to reduce the risk of such a catastrophe. Many people will disagree. Some of them think that the relationship with China is working fine, and that accommodation – or further accommodation – is unnecessary. They think that Washington is committed to a good relationship with Beijing, and that China will be satisfied with the kind of relationship America is offering now. I think this is too optimistic. The relationship today can manage day-to-day stresses, but is not robust enough to withstand real problems. Some people cite the Chen case earlier this year as proof that the relationship is strong, but the fact that such a minor issue can cause such anxieties about the future of the world’s most important bilateral relationship surely points the other way. The U.S.-China relationship is probably going to have to face much greater stresses in future, and it is not at all clear that it is strong enough to withstand them. Furthermore, the relationship seems to be getting weaker rather than stronger over time, so the risk of a rupture grows. The present fabric of the relationship is weak and getting weaker because China’s and America’s ambitions in Asia over coming decades are inherently incompatible. It is important to my argument to explain why this should be so. Those who think that America is already accommodating China have perhaps not really registered what is at stake here. For the past 40 years the Asian strategic order, and the U.S.-China relationship, have been based on a conception of American leadership which places all other countries in Asia in a clearly subordinate position. American policy today precludes any substantial change in this status quo over the coming decades. This was made clear by Barack Obama in his speech in Canberra in November of last year. American optimism about the future of the relationship therefore depends on the hope that China will find this acceptable. 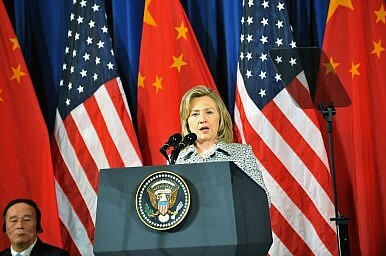 It is often said that America’s policy towards China today is not containment. But Washington clearly does resist any substantial expansion of China’s influence at the expense of U.S. primacy. So if it’s not containment, that can only be because China is not seeking such an expansion.